There’s this meal — it comes every single day whether I like it or not and it is a continuing source of stress for me. At this meal, my kids turn their noses up at anything new; we’re always in a rush because we are pressed for time, and I am perenially un-inspired to come up with new things to make for them. The meal? Breakfast. Both Andy and I have gone on record declaring it the Hate Story to our house’s Dinner’s Love Story. Somehow, when the girls show up at the evening table, they show up with minds open, tastebuds flexing. They will eat oysters and duck curry and on occasion have been known to fight me for the last piece of Hamachi crudo. But at breakfast? Forget it. If it’s not one of the SuperStarches of the Morning Table (French Toast, Pancakes, Bagels) they’re not interested. Until now. I’m almost afraid to type this for fear of jinxing things, but we seem to be in a good place — thanks to Abby’s sudden affection for the overpriced, oversweetened Starbucks parfaits, and Mom’s polite suggestion to maybe just maybe have one at a different time of day? Like say…Breakfast? Phoebe got on board as soon as I told her we could make the granola and she could customize the batch however she liked it. The backbone: I start with a simplified version of the one I loved in the Times last year: Oats, brown sugar, coconut, syrup, oil, salt, and cinnamon. 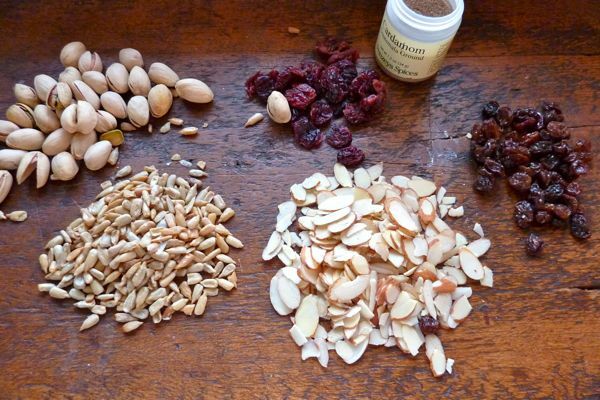 Then we add the Variables: Pistachios, sunflower seeds, sliced almonds, raisins, dried cherries, cardamom. Not shown: pepitas, hazelnuts, chopped walnuts, flaxseed, sesame, millet, dried pineapple, apricots, or apples. Spread mixture on a rimmed baking sheet in an even layer and bake at 300°F for 45 minutes, stirring every 10 minutes, until golden brown. Transfer granola to a large bowl and let cool. Finish by tossing in some post-bake extras. handful of dried fruit such as: dried cherries, apricots, raisins, pineapples, apples. Store in an easily accessible jar. To make parfaits, layer plain yogurt, granola, honey, and fresh fruit (such as jarred Morello cherries from Trader Joe’s — pictured — or pomegranate seeds, strawberries, blueberries) in the most fun glass you can find. Note: Phoebe picked the basic formula plus coconut flakes plus pistachios and almonds. She likes hers with no fresh fruit. Abby takes hers with cherries and pomegranate seeds. We had our usual breakfast battle this morning, and I am always looking for new ways to avoid it. Thanks for the wonderful idea! It’s about time for us to make granola at home again. My kids all loved granola, which amused me because they didn’t like many of it’s components. Glad you could add another starch to the AM mix. Hi – I have been happily reading your blog and lurking here for sometime without commenting – so thank you for such great writing and meal inspiration. I could go on and on about how as a registered dietitian, cook, mother (he’s just 10 months old but still), avid reader of adult and children’s fiction, NYC resident and fan of Westchester (my husband is from Larchmont) your blog appeals to me on so many levels! Also – I just wanted to say dried mango is great in granola too. Jenny, You MUST try making your granola with coconut oil. It takes it to another level entirely. I use Melissa Clark’s recipe from “Eat this Now” – the sweeteners are brown sugar & maple syrup, which I melt with the coconut oil. It’s divine and gives you a really crunchy granola. actually, re-reading your recipe, it looks identical to clark’s except that she calls for coconut oil. Oh–fabulous! I too am suckered into shelling out for the overpriced oversugared Starbucks parfait!! Brilliant! Plus my ten yr loves to cook–he makes the no knead lahey bread. He will love this. Thank you! Curious as to what you think of the Silver Spoon Kid’s cookbook…since your book reviews are so awesome. I ditto the post above suggesting coconut oil- so good. Also, I’ve heard it’s best not to mix in dried fruit to the granola- just add it when you eat it. Over time the dried fruit can become rock like, but I guess it all depends on how quickly you go through it. I too have fretted over breakfast, wanting to send my kids to school with a full belly. I decided that within certain limits, most anything goes. Oftentimes this is leftovers from the previous night’s dinner. I can’t tell you how many times they’ve eaten spaghetti & meatballs for breakfast. They might have a lunch meat sandwich, chicken noodle soup (Trader Joe’s! ), you name it. On occasion this includes a junky cereal. Give leftovers or other non-traditional breakfast food a try. This will be a fun after school, after homework cooking activity the kids can do. A great bedtime snack too! I just made a batch. I used a really nice hazelnut oil that I have in the pantry looking for a purpose. I will sautee some apples in a little butter and cinnamon sugar in the morning and pour a little warm milk over them and then sprinkle the granola over top for a nice warm breakfast for the kids. This helps us get through our 50 pounds of apples that we picked last weekend. I have never used coconut oil, but will have to try it. Yes, Melissa Clark has long been a granola inspiration! (And an inspiration in general!) Especially her olive oil granola: http://www.dinneralovestory.com/ill-miss-you-granola/ but I like to cut back on the coconut and b. sugar. As for dinner leftovers for breakfast — we’ve done apple pie and potato salad, but, uh, never spaghetti and meatballs. That’s pretty funny. Yes! Love granola. Of course in my house one kid loves it and one doesn’t. 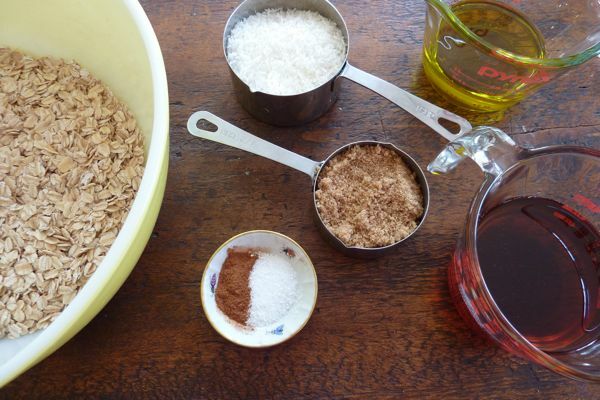 I usually add (at the very end of cooking) a handful of wheat germ and/or ground flaxseed. Just for a bit more nutrition that doesn’t hurt (read: taste weird). Also usually put in a bit of vanilla, and often substitute melted butter for some/all of oil. 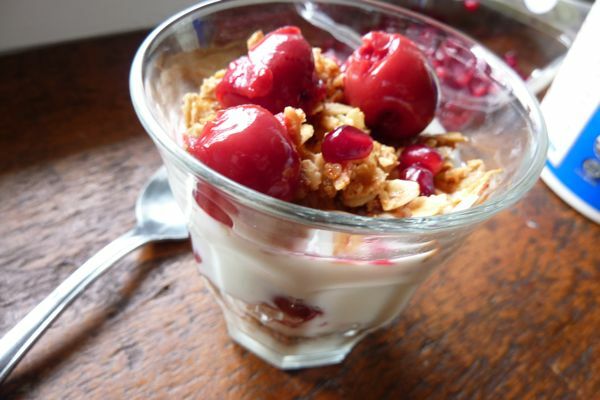 I tried a version of these this AM — used some store bought granola that we had in cupboard. Success!! I thought I was sunk when my daughter’s first comment was, “Ugh, is there GREEK yogurt in this?” But I selectively ignored that and both kids tasted and loved it. Hooray! Now we can make our own granola and take it to the next level. I just bought some coconut oil and will have to try this. I made some granola a while back that used strawberry juice (obtained from macerated sliced strawberries, I reserved the strawberries for yogurt and ice cream toppings). It turned out delicious and very crunchy. I highly recommend switching out part of the sweetener for some strawberry juice! FABULOUS! I am an avid fan of granola and cannot wait for my 1 yr to get over her “no I don’t want any type of solid food unless it’s in cookie form” phase so I can make this for her. Bircher might be another option? You can pretty much add whatever you like to it (Stephanie Alexander has a good basic recipe in the Cook’s Companion.) It can be made in advance (will keep for a couple of days), is healthy, delicious, and interesting to eat. I 3rd the coconut oil suggestion — super tasty. Millet — do you mean like millet puffs, or just the plain tiny hard balls? Can you eat (chew) those uncooked? I have to second the leftovers suggestion! I have two kids who eat yogurt or cereal for breakfast — and one who eats leftover moo shu or pasta or a turkey sandwich. I used to think it was totally weird, but I realized the nontraditional breakfast eater often packs in more veggies and protein, so I have given up worrying about it! I will be trying your granola though, thanks! What a simple and healthier way to recreate the Starbucks parfait!. I love anything that I can customize for the picky 2 and 4-year old. By the way, I read the newsletter; do I win the placemat art?